HOWTO Generate password protected OpenVPN client configuration using EasyRSA. This piece latches on to an earlier article titled HOWTO setup OpenVPN server and client configuration files using EasyRSA available from http://www.alanbonnici.com/2018/01/howto-setup-openvpn-server-and-client.html. Go to that post for information on how to setup the server environment and generate certificates that are required to establish an OpenVPN connection. Creating a password protected client. All EasyRSA script commands operate within the EasyRSA folder and pki subfolder. No settings are written in the registry or in some area of your computer out of the EasyRSA directory. Also all EasyRSA script commands are relative to this folder. This makes the EasyRSA environment self-contained and portable. For example, the EasyRSA server environment used in this article originated on a different computer. It was stored in a completely different directory and on a different drive. The relation of client to server is many is-to one. You normally have multiple clients connecting to one server. There is nothing to stop a person from using the same client configuration on different computers but giving different clients their own unique certificate/configuration is good practice because it allows you to monitor activity. 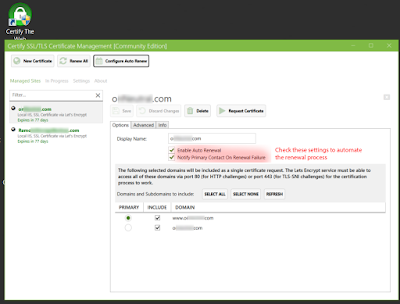 Having unique client configurations allows you to revoke the access of a particular client without impacting others. The EasyRSA server must sign each client request. This means that the generated EasyRSA server files must be retained in order to be able to sign future clients. The generated client files are also necessary if a particular client needs to be revoked. I find that password-archiving the entire EasyRSA server folder structure when not in use is the best way to retain the server. It requires a mere 600 Kb of disk space. The previous article on this topic created a client config file that was not password protected. The client configuration file generated here will ask for a password before OpenVPN attempts to tunnel through. This additional layer of security ensures that if someone manages to get hold of the ovpn config file (e.g. shared computer) they still would not be able to establish a connection to the server without the client’s private key password. The tutorial explains how to achieve this. Extract the downloaded EasyRSA archive to a location in which the client files will be generated. In this tutorial this folder will be called EasyRSA-client2. From within Windows File explorer go to the EasyRSA-client2 and double click on EasyRSA-start.bat. This will open the EasyRSA 3 Shell for Windows. Initialise the environment and setup the folder structure for the client PKI. The command below will generate the client’s private key and it’s Certificate Signing Request (CSR). The client in this tutorial is called Client2. The script will prompt for a password related to the client’s private that is used by OpenVPN when attempting to connect using the configuration file. (Use nopass argument to skip the password prompt section – see first article). The typed in password will not echo. The location of private key and CSR are generated at the end of the script. The private key will used in the client’s config file while the CSR will be signed by the server. 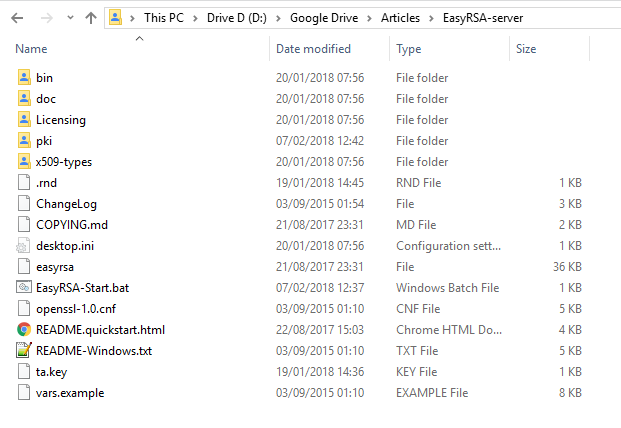 From Windows File explorer open the EasyRSA-server directory and double click on EasyRSA-start.bat. Since the server environment already exists (it was created in the first article) it will not be initialised. This ensures that the process adds new clients to previously defined ones. The command below imports the client’s CSR. Once imported, the CSR needs to be signed by the server. You need to confirm that you want to sign the client certificate by typing in yes. A file called \pki\issued\Client2.crt will be generated on the server. Part of this file will be incorporated into the client config. The client and server EasyRSA windows may be closed by typing Exit. The client configuration file will need to be assembled. Instructions on how to do that are documented in the prior article. The differences between this configuration file (client2.ovpn) and other clients is that the client related keys that are specific to each client. In this example since the client’s private key is encrypted the … section is commented with ENCRYPTED PRIVATE KEY. The config file is listed at the end of this article. When one attempts to connect using this config file the password associated with the client’s private key is requested. # the firewall for the TUN/TAP interface. # for the TAP adapter. # The hostname/IP and port of the server. # to load balance between the servers. # try hosts in the order specified. # to the internet such as laptops. # a specific local port number. # Try to preserve some state across restarts. # to silence duplicate packet warnings. # file can be used for all clients. # certicate has the correct key usage set. # EasyRSA can do this for you. # then every client must also have the key. # Select a cryptographic cipher. # then you must also specify it here. # negotiate AES-256-GCM in TLS mode. # Enable compression on the VPN link. # enabled in the server config file. # Set log file verbosity. Introduction OpenVPN allows client computers to tunnel into a server over a single UDP or TCP port securely. This HOWTO article is a step-by-step guide that explains how to create the server and client OpenVPN configuration files that makes this possible. In the process this article explains how to create the public key infrastructure (PKI) so that a client can securely communicate with the server. OpenSSL is the foundation for the security functionality of OpenVPN. The internet is not a secure place. If you’re not aware of this fact just google “computer security stories” or “data breaches” and click on the first few links that come up. All content on the internet needs to be secured. This article focuses on the secure transmission of data between your browser and the website that you are connected to. This is known as Hyper Text Transfer Protocol Secure (HTTPS). In order to secure communications certificates are used to encrypt data between you and the web site. A Certificate Authority (CA) is an entity that can issue, renew and manage these certificates.